At approximately midnight tonight, the BF and I begin our road-trip journey to Asheville, North Carolina. We’re leaving at such an odd hour because we want to hit the Blue Ridge Mountains during daylight, so we counted backwards. I am so excited for this trip… I’ve heard only amazing things about Asheville and have such a good feeling that we are both going to fall hard for the place. I will most definitely be posting about the trip, so have no fear bandits! 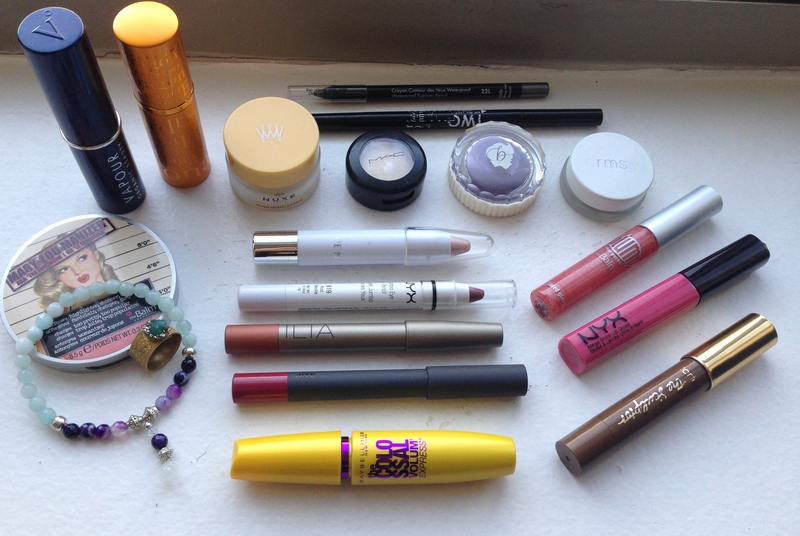 Anyway, this post, as I said before, is about what I’m bringing in my travel bag. I know for many people, myself included, packing is one of life’s more annoying endeavors, so I thought I’d share some words of wisdom to make it at least a tiny bit easier. My Vapour Atmosphere Luminous Foundation, which is so easy to blend with fingers and gives such a natural, glowy finish, so it’s perfect for travel. I chose two eyeshadow sticks, a NYX Jumbo Eye Pencil in Rust for more glam, evening looks (hello, New Years Eve!) and an H&M Eyeshadow Pencil in Pink, for daytime or more casual looks. The beautiful thing about eyeshadow pencils is that all you have to do is sweep them on, blend with fingers and add more to the crease or outer corners if you want a more detailed look. So simple. I also chose two lip sticks and two glosses, for variety, and because these sticks are slimmer than regular lipstick tubes, they take up no room at all. I think its a good bet to bring one neutral, like Ilia’s Iko Iko and one party shade, like Bite Beauty’s Meritage. For glosses, I like to have a pretty shimmer option, like The Balm’s Ruby My Grapefruit and one more pigmented, brighter option, like Nyx’s Tea Rose. 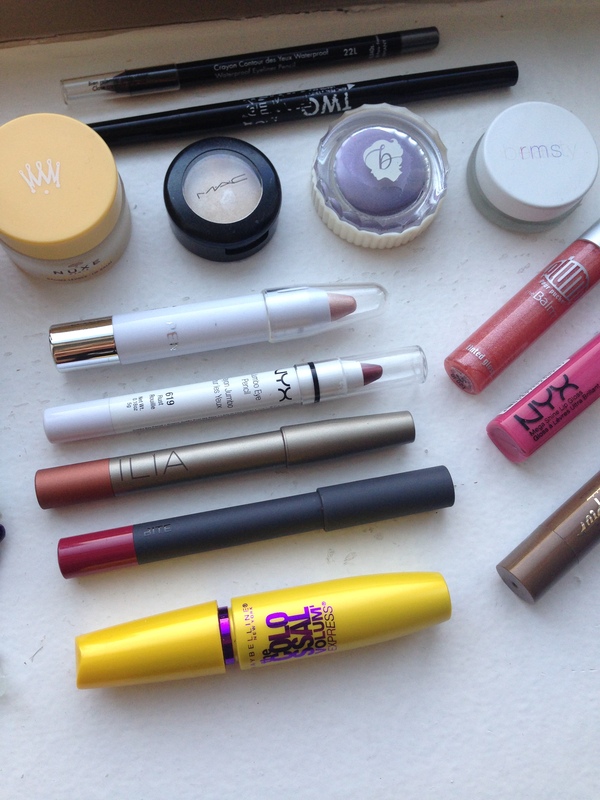 So, in just four small sticks, I have all my lip-bases covered. I also threw in two eyeliner pencils, one in a silver-grey and one also by NYX, which has a liquid liner on one end and a pencil on the other. That’s another helpful tip – always try and pack as many multitaskers as you can… it saves space, time and energy when traveling. 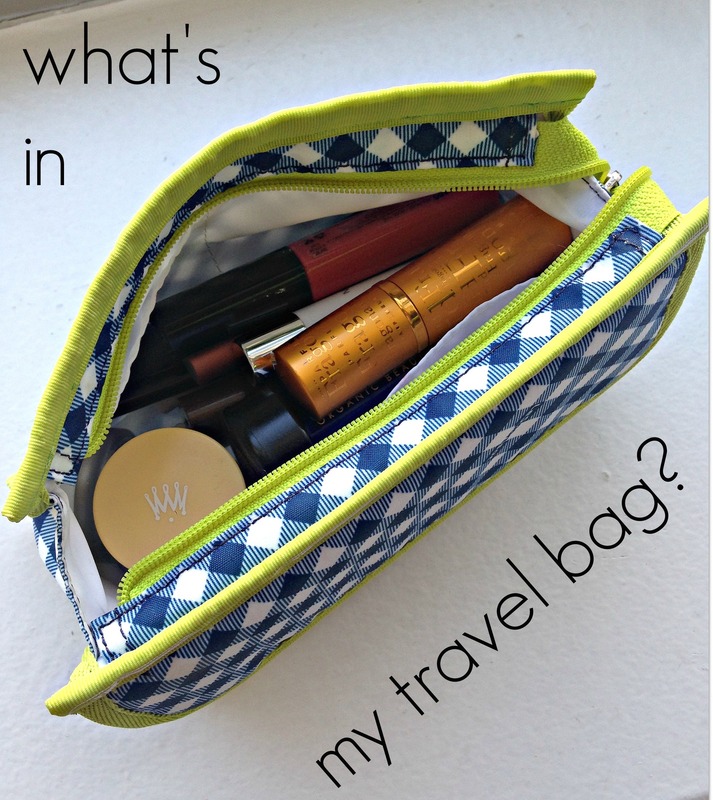 Now, perhaps the most unique stick of the bunch is my travel solution to bronzer. My all-time favorite bronzer is Alima Pure’s Mauna Loa, but it is powder (messy) and needs a brush. So, instead I will be bringing Tarte’s Contouring Face Slenderizer, which is a stick that you use to draw on any area you would like to contour or bronze a bit and then just blend with your fingers. Sticks, why you gotta be so smart? Mascara is pretty self-explanatory, although I do have some ‘splainin to do. Now, everything mentioned in this post so far has been either non-toxic, green or cruelty-free. The one item I have truly not been able to find a decent green replacement for has been mascara. Nothing has come close to the Maybelline mascaras, which give incredible false-lash effect. So, here I’ve packed my Maybelline Colossal Mascara, because when you need good eyelash, this is the best. That being said, if you have tried any natural mascaras that you love, please let me know! Although sticks are the real star of this show, I’m also a big fan of the pot for travel. Potted makeup is just as easy as stick makeup, since all you have to do is swipe some on your finger and apply. My fave pots to travel with are my RMS Living Luminizer, which gives the most angelic, natural highlight, along with Mac’s Nylon Eyeshadow for inner-eye corners. I have one cream eyeshadow from Benefit in Always A Bridesmaid, which is creaseless for foolproof on-the-go application. Lastly, I always like to bring a couple pieces of jewelry that I can wear every day when traveling, so for this trip I am bringing my two new favorite pieces that I got for Christmas! 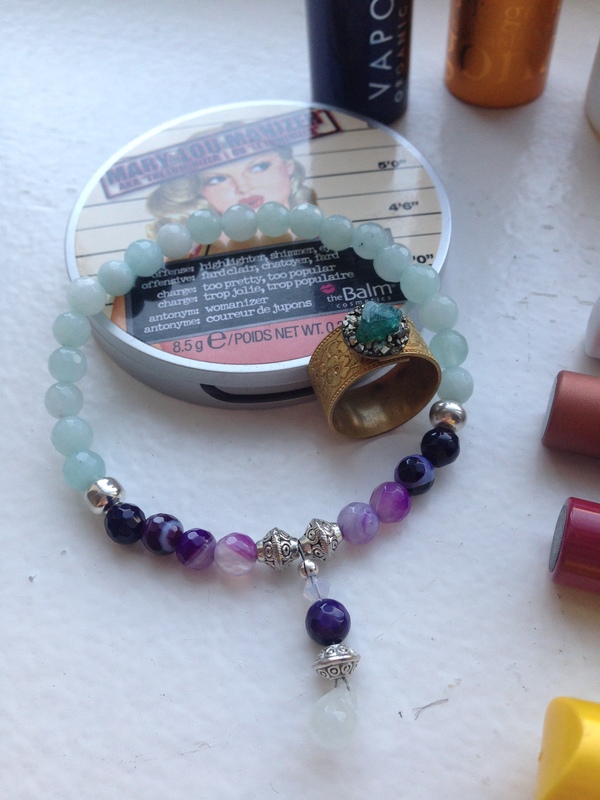 One is the beautiful aquamarine, agate and jade healing bracelet the BF got me from BlissfulLily, that now resides permanently on my wrist. Second is the most amazing ring I’ve ever seen, which my dad got for me. I’m so in love with the detailing – it has etched flowers on the band as well as apatite and pyrite. Unfortunately it is one-of-a-kind, but you can check out similar pieces at Xuanqirabbit’s Etsy Shop. PS: Mary-Lou-Manizer isn’t coming along on the trip, I just used her to show off my jewelry. PHEW, that was a long post, but I hope you enjoyed it & found it helpful! Stay tuned for more on our road trip to Asheville & we’d love to hear any recommendations if any of you have been or live there!